Furniture is an important part of any bathroom, in order to provide much needed storage space and keep your bathroom clean and tidy. Bathroom Takeaway offers a variety of furniture, including freestanding and wall hung vanity units and mirrored cabinets, in a wide range of styles in order to match the design of your space. Vanity units are perfect if you need extra storage space in your bathroom. Wall hung vanity units are ideal if you don’t have much floor space. All of their wall hung vanity units come with at least one soft close drawer and the majority come a basin, providing a two in one solution. The freestanding bathroom vanity units are bigger in stature and therefore offer more storage space than the wall hung alternative. Therefore, they are ideal for busy family bathrooms. Bathroom cabinets are also a classic addition to any bathroom. The majority of cabinets from Bathroom Takeaway also come with an LED mirror and are perfect for storing small items that don’t necessarily need to take up valuable space in a vanity unit. These storage units are ideal for any family bathroom. All furniture from Bathroom Takeaway is available in a range of sizes, styles and materials – including: oak, walnut, ash grey and white high gloss. Their attractive, sleek edges make the vanity units minimalist, in order to perfectly match the style of your bathroom. 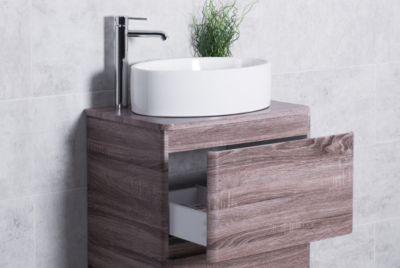 As well as a range of vanity units, there is also a range of toilet and basin units that offer additional storage, whilst also saving valuable floor space. Ideal for smaller, cloakroom bathrooms, the combination units are practical and stylish and are also available in a range of finishes to suit any colour scheme. All of their bathroom furniture comes with a 10 year ‘Fit & Forget’ guarantee, providing peace of mind for years to come. Bathroom Takeaway is a leading online bathroom retailer, based in Trafford Park, Manchester, with two showrooms based on Regent Road in Salford and Minworth Industrial Park, Sutton Coldfield. At Bathroom Takeaway, they are passionate about two things, Bathrooms and Customer Service. their focus is to provide our customers with their dream bathroom, without breaking the bank and making it as stress free as possible. Offering bathroom suites, suitable for the average size house and supplying the products our customers need, without any gimmicks or never-ending sales. Their customers are at the forefront of everything they do. They make sure everyone is treated as an individual, providing a tailored service that focuses on their priorities. They are extremely proud to say that their customer service team has been awarded the Feefo Gold Trusted Merchant award, four years in a row, so you can be sure that when you shop with them, you will receive excellent customer service, every time. All of their products are offered at competitive, affordable prices, without compromising on their quality. All of their products come with a ‘Fit & Forget’ guarantee and a 30-day money back guarantee. So, no matter what bathroom product you are looking for, you know you can rely on Bathroom Takeaway to provide you with the highest quality products, at affordable prices, all year round. With a huge 10,500 pallet warehouse and a state-of-the-art electronic order and picking system, lead times are short and the majority of their products can be delivered the very next day. 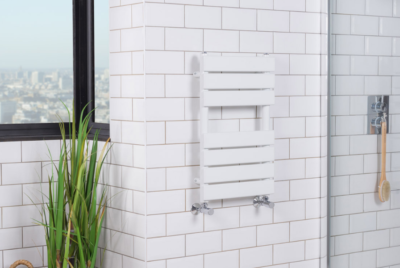 Their product range is varied, offering everything you need for your bathroom, no matter whether you are looking for a contemporary or traditional style bathroom. Their range varies from full bathroom suites, to individual products including ceramics, showers, heating products and bathroom accessories. Shop the latest bathroom styles, click to order, sit back and let them deliver it to your door. Alternatively, visit their friendly staff in either of their showrooms and see the quality for yourself.